With the explosion in popularity of American Whiskey, other spirit categories have tried to ride whiskey’s coattails with crossover offerings aimed squarely at whiskey consumers. The most common way for non-whiskey brands to do this is with oak, namely via the now extremely pervasive “Black Barrel”. Basically, by extra-aging a spirit in a deeply charred barrel, that spirit gets an infusion of strong oak and color, and seemingly, instant whiskey consumer friendliness. The list of brands to “go black” is fairly long and includes such major releases as Johnnie Walker Double Black, Jameson Black Barrel, Captain Morgan Black, and Mount Gay Black Barrel. Tequila producers have also been eyeing that whiskey consumer, and there has been a dramatic increase in anejo and extra anejo releases aimed at them, including Tequila Avion Reserva 44, 1800 Milenio, and Gran Patron Piedra. Much of the movement in the tequila space has been aimed at the high end whiskey consumer. Jim Beam/Suntory (owners of the Hornitos Brand) deeply understand the lower end of the price spectrum and have seized the opportunity to bring a lower priced tequila offering aimed at the value-driven whiskey consumer. Hornitos Black Barrel Anejo Tequila takes the standard Hornitos anejo tequila aged for a year in traditional oak barrels and then finishes that tequila in heavily charred American Oak casks for four months, and then moves it to a toasted American Oak barrel for another two months. The aim here is to get some deep color and oak from the heavily charred barrel and then additional sweetness from the toasted oak barrel. Hornitos Black Barrel Anejo Tequila (40% ABV / 80 proof, $29.99, NOM 1102) is dark gold in color and visually could easily be mistaken for an American whiskey. The nose, however, is decidedly tequila, with black pepper, vanilla, and roasted agave mixed in with old oak. While the oak notes in the nose are fairly strong, they don’t completely obliterate the core tequila aromas. 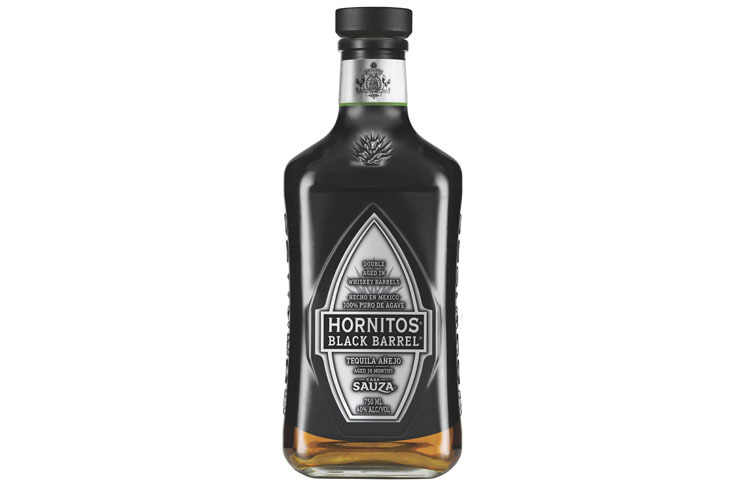 The entry for Hornitos Black Barrel is oak forward, but it has some sense of balance with roasted agave, black pepper, and caramel. It’s really here in the entry where this tequila is at its best. As we move on to the midpalate, the pepper spice increases, ultimately outpacing the oak. The midpalate is all about pepper kick – it’s black pepper, white pepper, clove, habanero, and then oak. There is an undercurrent of sweet agave to help balance all this spice out and it does a fair job of it, until the end of the midpalate when the spice and heat overtake everything else. Perhaps the weakest part of the Hornitos Black Barrel equation is its finish. It’s a little hot and overly dry. The flavors established in the midpalate evaporate, leaving a slightly bitter combination of white pepper, oak, and raw agave. One of the things that Hornitos Black Barrel Anejo Tequila has going for it is its price. At $30 a bottle, this Hornitos is really more of a mixing tequila than sipping, and it is an easy tool to create variations on classic whiskey cocktails: a teaspoon of agave, a couple dashes of bitters, Hornitos Black Barrel, and some ice and you’ve got a delicious take on the Old Fashioned. It’s mixed, or with ice, that Hornitos Black Barrel really shines. We don't think that anyone would argue that Hornitos Black Barrel Anejo Tequila is amazing tequila, but Beam Suntory (the brand's owners) haven't priced it as such. Hornitos Black Barrel is an interesting riff on anejo tequila aimed squarely at American whiskey drinkers.